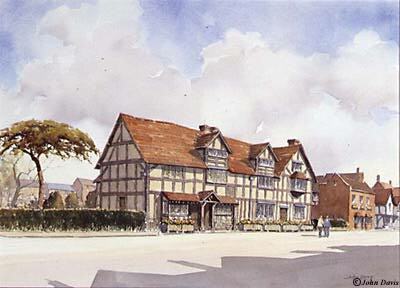 From the age of seven to about 14, he attended Stratford Grammar School receiving an excellent well rounded education. At the age of 18 he married Anne Hathaway, who was seven years his senior and three months pregnant. She was of 'yeoman' stock - her family owned a farm one mile west of Stratford in Shottery. He endured her until he could stand it no longer and fled to London to become an actor. He then became actor-manager and part-owner in the Blackfriars and afterwards the Globe Theatres. He was a first-rate actor, but it is as a writer of plays that he has achieved lasting world-wide fame. His plays are thought to be the finest ever written in any language. His 37 plays vary in type; historical romances, light, fantastic comedies, some are tragedies, all including the comical and the farcical. He was a shrewd business man, amassing quite a fortune in his time. He returned to Stratford for his latter years where he died at the age of 52 and now lies at rest in his special grave at Holy Trinity Church.